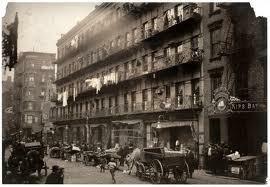 The street back in the days of the tenements, was favored by Sicilian immigrants. The area was crime-plagued with the Mafia and The Black Hand. The Black Hand was unorganized but responsible for extortion and a bombing on the street. In the 1890's clothing factories moved in in which many single Italian women worked as sewing maching operators.